Writing a book is an incredible journey. It starts with an idea and evolves through a long, often challenging, always exciting process. It ends with a tangible, finished product that you—and hopefully many other people—will hold in their hand. 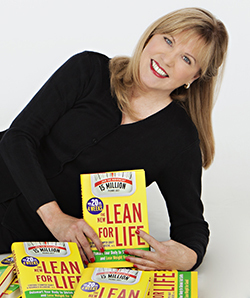 Writing and publishing a book like The New Lean for Life is the first phase. Letting people know about the book and how it can improve their lives is the second phase. We’re currently having a lot of fun doing interviews with TV and radio shows, magazines, newspapers, and websites. We’ve also just launched a unique contest to inspire an important segment of readers to get healthier by doing the Lean for Life program. Last week, we introduced “The Mommy Movement California Weight Loss Contest” with a Twitter party. Moms across California will form teams of up to 5 to compete in a weight loss competition. The teams will submit “before” photos and post updates about their progress on Twitter (using the hashtag #NewLeanForLife), Facebook, Instagram and leanforlife.com. The winning team will be chosen based on weight loss, physical transformation, and the personal stories each participant submits. The winners will enjoy a two-night getaway to New York City, where they’ll take a bite out of the Big Apple, see a Broadway show, and share their success stories with the media. We love the idea of inspiring moms to “do” The New Lean for Life for a couple of important reasons. Healthier moms raise healthier kids. Our children are currently fighting a losing battle against obesity. Educating moms and teaching them how to eat better, move more and stress less will not only impact their lives, but the lives of their entire families. The opportunity to become a healthy role model to their kids is a prize that every woman who participates is guaranteed to win… whether or not she’s a member of the team selected to go to New York. It’s also a wonderful way to recognize and celebrate women who often take care of everyone else while putting themselves last. We’re excited that this “Mommy Movement” contest will create an added incentive for California moms to take time for themselves—and to take better care of themselves. By being part of a team and connecting with other women who are interested in losing weight and becoming healthier, the nurturers will have an opportunity to be nurtured. And that process has already started! The Twitter launch party was so fun, so lively, and so full of positive energy. Stay tuned. The stories—and the results—are sure to be inspiring!